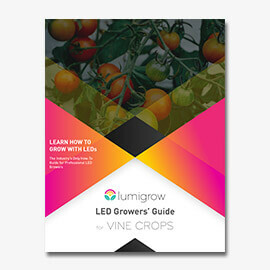 Vine Crops • LumiGrow ""
Vine Crops are some of the most prolific greenhouse produced crops in the world, with the top three being tomatoes, cucumbers, and sweet peppers. Supplemental lighting is crucial for vine crop growers due to the high light needs of their crops. LumiGrow LEDs provide multi-use utility for vine crop growers. First, the luminaires efficiently provide optimal light levels for healthy crop production in dark seasons. Second, the dynamic adjustability of our LEDs (when used with smartPAR), allows for control of desired crop characteristics. Research and commercial production data has proven that increased yield, more control over growth rate, extended crop life, and higher quality vine crops are all possible with LumiGrow Smart Horticultural LEDs. The effects of light spectra have extensively been tested on vine crops by major researchers and commercial growers, as well as by the LumiGrow Research Group comprised of in-house plant scientists and PhDs. Conclusive research has proven that you can control characteristics of tomato growth throughout every growth stage. Different ratios of red to blue light have been shown to affect yield, growth rates and flowering in seedlings and mature plants. Cucumbers have also been proven to be highly sensitive to light, and can be readily manipulated using red and blue wavelengths. LumiGrow is currently exploring the feasibility of using LEDs for tomato, cucumber, and sweet pepper production. 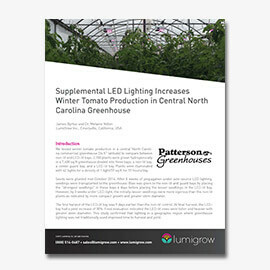 Learn how LumiGrow LEDs are being used to increase tomato production in this LumiGrow research. Upgrade to smartPAR Wireless Control and experience the benefits of smart horticultural lighting! 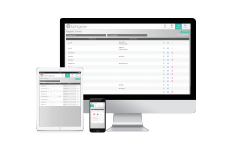 Deploy modern lighting strategies from any smartphone, tablet or computer.